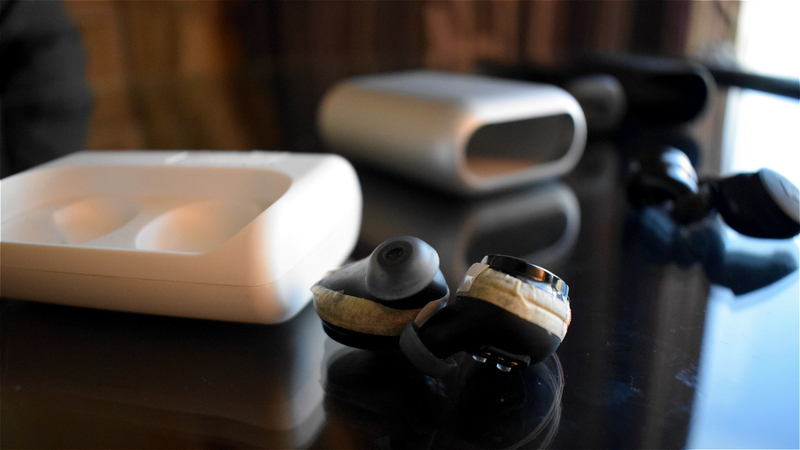 Nestled in a room at the back of Las Vegas's Venetian hotel, Bragi wasn't at CES to show off a new product; what it had was much more exciting. No, it's not bringing Spike Jonze's Her to life (yet), but it is making a big step forward in smart audio that will dramatically change the way the Dash hearable works. The Dash already has an audio passthrough which lets you have a conversation while keeping your music playing, but Bragi is soon to push this further with 360-degree 3D audio. On the table in front of me sat a pair of bandaged Dash earbuds, inside of which was new software that turns the Dash's audio passthrough into a mixed reality feature. At first I tried a demo of the standard passthrough where I was listening to a the sound of a barber cutting my hair, while voices from the real world around me also fed in. Bragi CEO Bragi Nikolaj Hviid wanted to demonstrate that the artifical audio followed me as I turned my head, while the position of real-world sounds stayed static. Then I was given a second demo where I could hear a helicopter flying around me. This time, as I moved my head about, the position of the audio source remained fixed, giving it the impression it was actually flying around me. A third demonstration had two different people speaking on either side of me, and turning my head changed how well I could hear them, again, like they were really sat there. It works by putting 128 artificial speakers all around you, and as you turn your head the sensors detect your movement. It's all software though, and will come as a free update to the existing Dash later this year. "We're still in the research phase," said Hviid, although it feels like it can't be too far off. Most impressive isn't so much the 3D audio itself, but that Bragi will be able to beam it to every Dash owner with the push of a button. As I listened, my mind raced with so many of the potential uses this could have, from watching movies (something Hviid sees as an area of "big potential") to virtual reality to navigation. Take a Skype call - the Dash's new feature could "place" other speakers around the room. You could have one in front of you, while two others remain fixed either side, giving the impression that they're really there. During our briefing, Hviid continued to repeat the words "wearable computer" to underline the difference not only between Dash and Bragi's more recent Bluetooth headphone, but from many other hearable makers (Apple and its AirPods, for example) that lean on the smartphone to do much of the work, or don't offer any truly smart features at all. 3D audio already exists, but to have all that being processed inside a pair of wireless earbuds is mighty impressive. At the start of last year, hearing tech company Starkey announced a partnership with Bragi, and this 3D audio technology is the first fruits of that relationship. "You can have a navigation system where a voice says 'Come over here' so you know where to walk," ponders Hviid as one potential feature, "or I'm running and speaking to someone and I hear their voice turn left, so I know to turn left too". Or maybe you're watching TV with a friend and you want it louder, but they don't - the Dash would let you each have your different listening experiences while also being able to hear one another. These are just a couple of ideas, and we're bound to see even better ones come to light as Bragi starts talking more about the update. I really can't wait.